When your business target private sale, your website need equipping with functions that weren’t supported by Magento default. For example, you have some items that only sell to wholesalers with discounted price. The customers can’t see the price of products until they log in their wholesale account or they have to submit a contact form to request prices of products if buying in bulk. 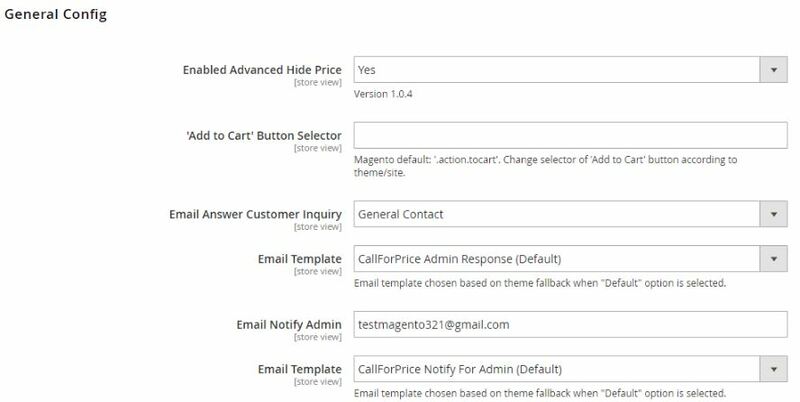 Magento 2 Hide Price Call For Price extension offers you the optimal solution to do all of the actions above. Many extensions are developed with just one function: Call For Price or Hide Price only, but Magento 2 Hide Price Call For Price extension by BSSCommerce combines these two functions into just one extension. Firstly, let’s make it clear. What is Call For Price? What is Hide Price? Call For Price function allows admin to display a contact form to obtain customers’ request on product price. 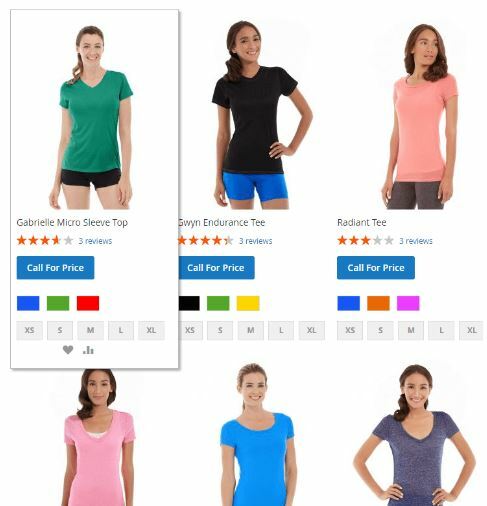 The price of products and the Add to Cart button is disabled while a Call For Price button is displayed. 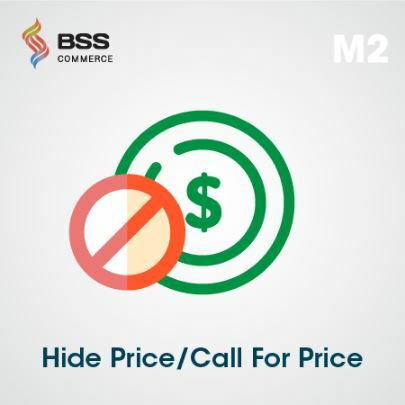 While you need to install two different extensions to have all of those features, BSSCommerce Hide Price Call For Price extension provides both functions in easy-to-use Magento 2 extension. Send price request with Call For Price form. Disable Add to Cart button and show a custom message. Hide prices of products for not-logged-in customers and other customer groups. 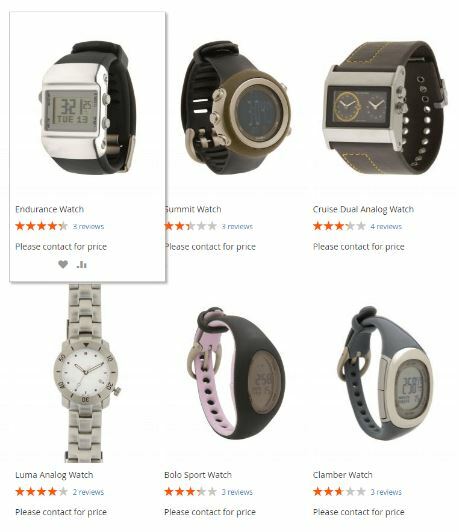 Hide product price on all position of any page: Product page, Category page, Wishlist page, Comparison page, Related, Up-Sell, Cross-sell block. Disable product price for specific categories or each product. Change the Call For Price form as wish (text, field, types of fields). Compatible with all product types, products with custom options (text field, text area, date, drop down, time) and products with special price or tier price. 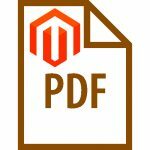 Magento 2 Hide Price Call For Price extension is the perfect extension for Wholesale / B2B websites. It helps you conduct private sales to target the wholesale customers better while still operate your site for regular customers. Here are three remarkable reasons to prove that that Hide Price Call For Price extension by BSSCommerce is best for your website. Without having to disable the product, you can keep the appearance of product on site while still hide the price of that item. This feature is useful when your site has special products with price that requires updating or verifying, price that changes depending on circumstances, or price of customization services. The Call For Price function allows you to create a Call For Price form for customers to directly exchange wholesale price for bulk buying. This contact form appears as a pop-up when customers click the Call For Price button. The form includes customer name, contact number, and request of product price. You can customize the content and design of the Call For Price contact form as wish. You can disable the price of several products or the whole category for the unregistered customer groups. Not-logged-in customers can only see the message “Please log in to see price” and can’t add the product to cart or know the product price until logging in your website. This function helps restricting untargeted customers to know your product’s price and even avoid unwanted competition from the rivals. Let’s get a tour around backend configuration of Magento 2 Hide Price Call For Price extension by BSSCommerce. The module configuration has two main parts: Customer Inquiry List and Configuration. Customer Inquiry List presents all customer requests which sent via the Call For Price Form. 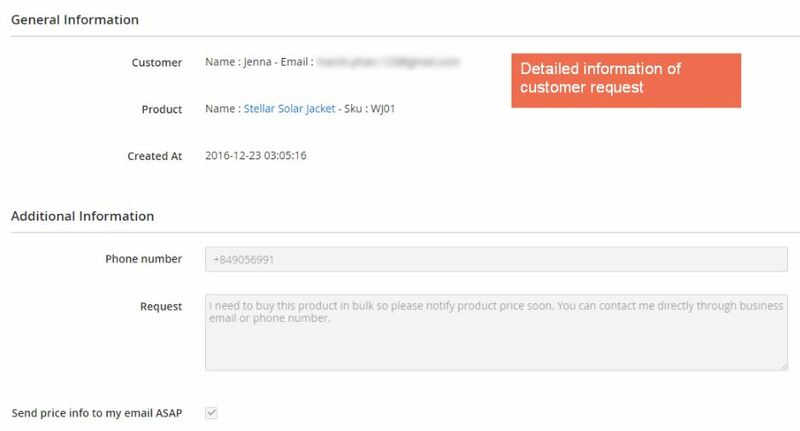 In here, you can know detailed information about customers’ inquiries and decide to send email announcing product price with a simple click. Here is an example of the email that customers receive. The General Config permits you to enable or disable the extension and set up email sender as well as email templates for both admin notification email and customer reply email. As indicated by the name, this section allows you to prioritize the Call For Price function or Hide Price function. 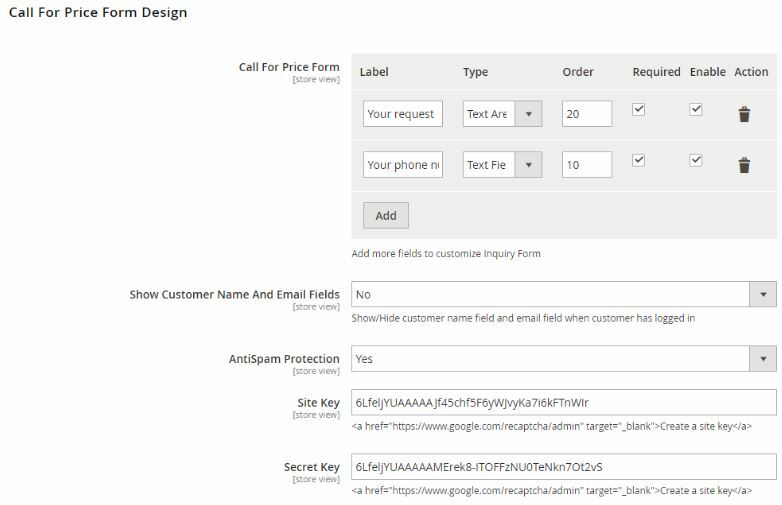 In this section, you can set up the design for the Call For Price Form. 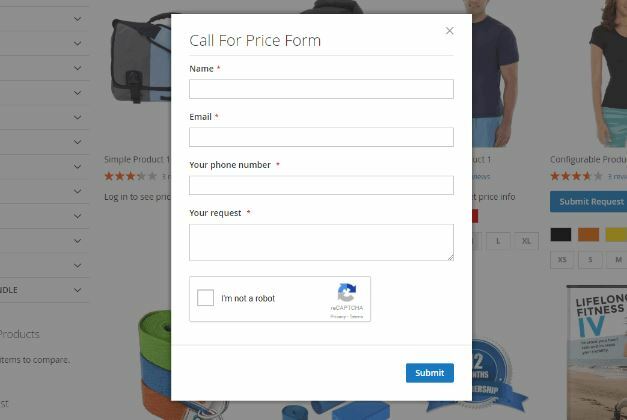 You can add more or remove fields on the form, change the field type, set the field as required, enable or disable the chosen field, and add the reCaptcha test to the Call For Price form. 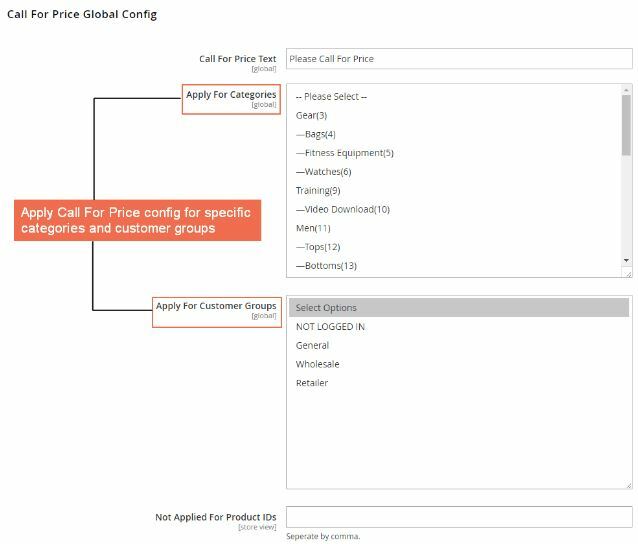 Call For Price Global Config let you set up Call For Price function, including entering text for the Call For Price button, and applying Call For Price for categories or customer groups. 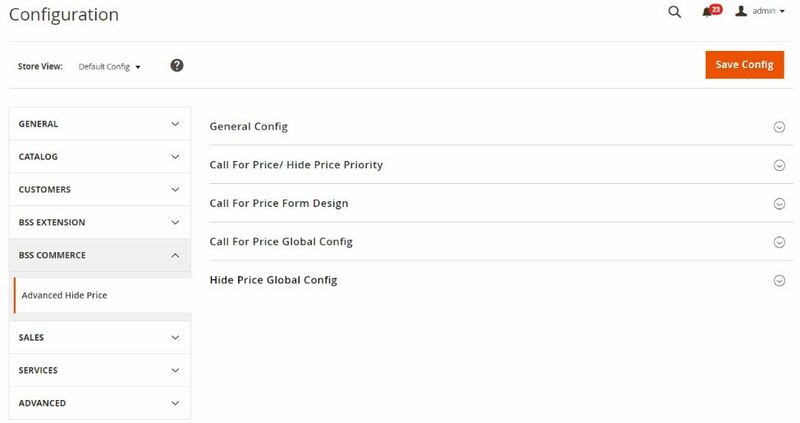 In this section, you can configure the Hide Price function, such as decide text for the Hide Price custom message and apply Hide Price for categories or customer groups. How to Apply Hide Price Call For Price for Each Product? 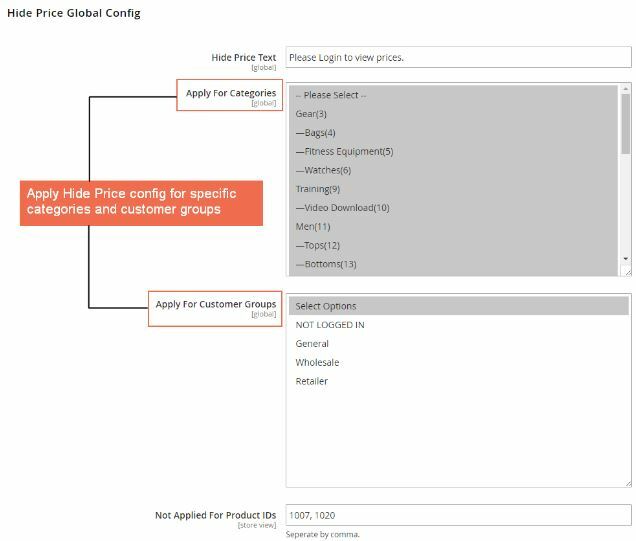 When you enter the Edit Product Page in the backend, you can see the additional config to fully set up Hide Price function or Call For Price function for each product, choose the text and apply the function for customer groups. You can experience BSSCommerce Hide Price Call For Price extension for Magento 2 by visiting the frontend demo. The Call For Price form appears after you click the Call For Price button. 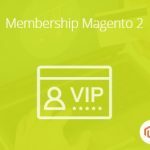 Magento 2 Hide Price Call For Price extension provides full functions with both Hide Price function and Call For Price function. 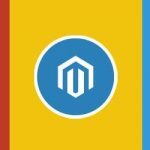 This extension is excellent for any Wholesale/B2B website to satisfy all of your price hiding requests. With the reasonable price of $79.00, you can get this extension with free installation services, free update, and free 1-year support.